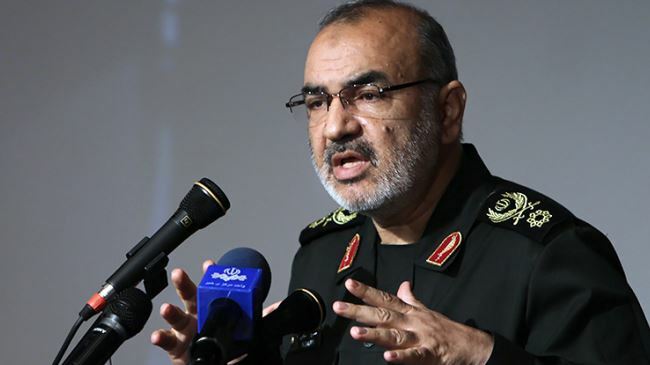 FNA – Lieutenant Commander of the Islamic Revolution Guards Corps (IRGC) Brigadier General Hossein Salami underscored Iran’s missile power and influential role in the region, noting that Washington is unable to confront Tehran. “The enemies have attempted to block all our paths to power, and our achievements today have been earned against enemies’ wish and desire,” General Salami said in the Western city of Shahr-e Kord on Monday, addressing the annual nationwide February 11th rallies marking the 40th anniversary of the victory of the Islamic Revolution. “The world arrogant powers have used all their power to stop the Iranian nation; they have laid siege on us and sanctioned us whenever we moved towards science, production, etc. They assassinated our scientists to prevent our progress, but we have progressed despite their will,” he added. General Salami said that enemies want to disarm Iran and have asked the country to give up its missile program because they are aware that when Iran is strong, it will not bow to their pressures. Now, the US secretary of state calls on Tehran to end its influence in the region. This means Washington is not able to stop Iran’s influence and is, thus, asking Iran itself to do so, he added. Huge masses of people from all walks of life converged on streets and squares all over the country to express their support for the cause and ideals of the Islamic Revolution during the February 11 rallies. During the rallies in Tehran, the IRGC which has gained self-sufficiency in production of different missiles in the past few years displayed three of its ballistic and cruise missiles named Qadr, Qiam and Zolfaqar. Iran in September 2016 started mass-production of home-made Zolfaqar missile that carries a Multiple Re-entry Vehicle payload and can destroy targets in distances up to 700km in range with a zero margin of error. Zolfaqar, the latest generation of Iran’s mid-range missiles, which was unveiled during the nationwide parades of Armed Forces in September 2016, is capable of carrying MRV payloads and can rain down missiles on ground targets with a high level of precision-striking power. Qiam missile is also capable of carrying different types of ‘Blast’ and ‘MRV’ payloads, and can destroy a wide range of targets. It can be launched from mobile platforms or silos in different positions and can escape missile defense shields due to its radar-evading capability. Qiam is also a new type of surface-to-surface and cruise missile of Iran.